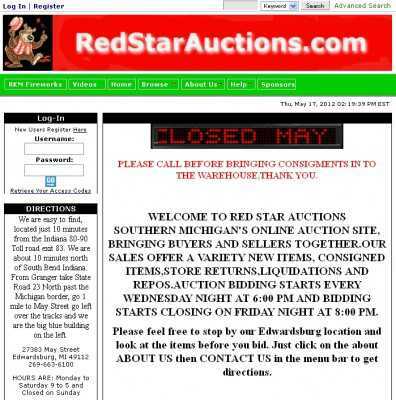 For those who live in Southern Michigan, Red Star Auctions is one of the best online auction sites you can find. It sells a wide range of new items, store returns and consigned items, and these include everything from clothes and electronics to accessories and parts for vehicles. The site can be browsed by category, and you can focus your search either on open or closed auctions only. And once you have it, you can search the site by item number. Bidding starts every Wednesday night at 6:00 PM, and it closes the next Friday night at 8:00 PM. Registration to RedStarAuctions.com is free, and you have to submit a valid credit card in order to start bidding. And once you have placed a bid, you can keep track of the item by using the site’s bid management features. You’ll know if someone outbids you right away, and (if there’s still time) you’ll be able to do something about it. When compared with something like eBay, the main advantage of a site like this one is that you can see the items sold through Red Star Auctions before bidding for them. You can visit Red Star Auctions’ warehouse (located in Edwardsburg – driving directions are available here) and take a good look at all these items that you’re thinking of buying. So, no nasty surprises here. You’ll always know what you’re getting well in advance.